3 Lane Bungee Basketball Game players, harnessed to a bungee cord, try to run down the lane as far as they can to shoot a basketball into the basket. Three (3) people can play at a time, allowing for a lot of action! This unit was designed with you in mind. Our 3 lane bungee run is different, Never before made for any company. We put our heads together and asked how can we make this the best bungee run ever. Others had 2 lanes so we gave it 3. Others had no wall at the end so for safety we added a wall at the end. No one had basketball hoops at the end we just threw that in for the fun of it. You run and stretch the bungee, and then try to toss the ball through the hoop at the end before you get snapped back. 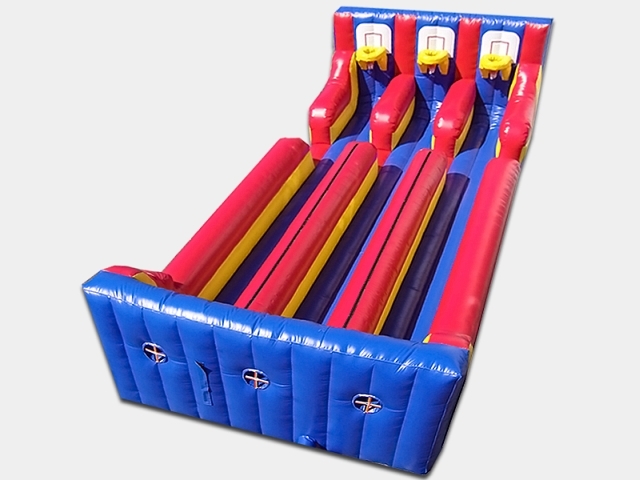 JumpMaxx prides ourselves in providing America with newer, cleaner, high end entertainment with inflatables like the Bungee Run and many others.